This simple tutorial will show you how to boot your Ubuntu system directly into command line (text mode or console). If you just want a console for temporary use, press Ctrl+Alt+F1 on keyboard will switch your desktop to tty1. This opens Grub boot loader config file with text editor. 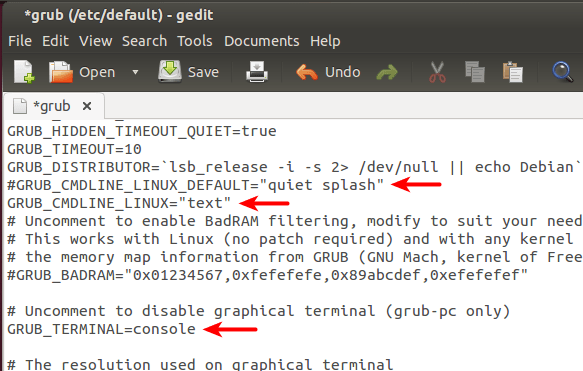 Comment the line GRUB_CMDLINE_LINUX_DEFAULT=”quiet splash”, by adding # at the beginning, which will disable the Ubuntu purple screen. Change GRUB_CMDLINE_LINUX=”” to GRUB_CMDLINE_LINUX=”text”, this makes Ubuntu boot directly into Text Mode. Restart your computer and see the result. Worked great in Linux Mint 16. Thank you!!! It is very useful to be able to restore the original file in case something goes wrong. It is also nice to be able to get a list of all edited files with `locate *.orig`. message: /usr/sbin/grub-probe: error failed to get canonical path of ‘/cow’. Wanted my Linux mint to boot in to text mode and it worked thank you very much. I am installing Lubuntu 14.01. But I cant access the GUI. HY, is path/to/youtusername in /etc/passwd/ or do you mean /home/user/ ? How the do I get back to being able to use the GUI??? all sorts of problems trying to get back to the way it was. So how do you do it when your machine boots with uboot, not grub? Unfortunately, it didn’t work in my circumstance. My operation system is Ubuntu 15.04 in Virtualbox. Even though I have modified the grub file and update grub, it constantly boots into the desktop mode. Anyone can help me on it? this is correct.. its a known bug in 15.04. I found a solution booting up Ubuntu 15.04 into console mode. I made some slight changes to my bashrc so I could easily toggle between command line interface and GUI, as service lightdm start didn’t work for me. This may help someone else. This is dependent of course on having saved the modified grub file as grub.console and the original as grub.ui. Now we can now toggle between console and ui mode simply by entering gui or console at a terminal! Nice inspiration. Thank you. I wrote a small tool for that which works fine with Lubuntu (Ubuntu 15.10). Feel free to use or modify it. You can easily switch between boot either to console or to gui. THis only partly works. It doesn’t boot into the gui, but I don’t end up with an interactive shell in the console either. No response to newline, no prompt. I have upgraded ubuntu 12.04 and now when i start ubuntu it only shows the command line screen. How cani will get to GUI. I am doing my research in big data analytics. After upgrade my ubuntu i got some errors like “hadoop is not in sudoers file”. Can anyone help me to solve this error. These instructions did not work for me in ubuntu 16. Instead, it was necessary to make these changes which I found on another website. The key thing is the “3” which causes it to stick with the terminal through phase 3 or something like that.